All my work, my life, everything I do is about survival, not just bare, awful, plodding survival, but survival with grace and faith. While one may encounter many defeats, one must not be defeated. Angelou's autobiographies are distinct in style and narration, and "stretch over time and place", from Arkansas to Africa and back to the US. They take place from the beginnings of World War II to the assassination of Martin Luther King, Jr. Angelou wrote collections of essays, including Wouldn't Take Nothing for My Journey Now (1993) and Even the Stars Look Lonesome (1997), which writer Hilton Als called her "wisdom books" and "homilies strung together with autobiographical texts". Angelou used the same editor throughout her writing career, Robert Loomis, an executive editor at Random House, until he retired in 2011. Angelou said regarding Loomis: "We have a relationship that's kind of famous among publishers." She was one of the most honored writers of her generation, earning an extended list of honors and awards, as well as more than 30 honorary degrees. She was a prolific writer of poetry; her volume Just Give Me a Cool Drink of Water 'fore I Diiie (1971) was nominated for the Pulitzer Prize, and she was chosen by President Bill Clinton to recite her poem "On the Pulse of Morning" during his inauguration in 1993. Angelou's successful acting career included roles in numerous plays, films, and television programs, such as in the television mini-series Roots in 1977. Her screenplay Georgia, Georgia (1972) was the first original script by a black woman to be produced. and she was the first African-American woman to direct a major motion picture, Down in the Delta, in 1998. 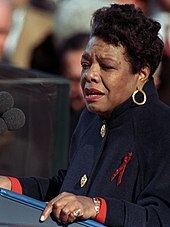 Since the 1990s, Angelou participated in the lecture circuit, which she continued into her eighties. Unless otherwise stated, the items in this list are from Gillespie et al, pp. 186–191. ^ McPherson, Dolly A. (1990). Order Out of Chaos: The Autobiographical Works of Maya Angelou. New York: Peter Lang Publishing. pp. 10–11. ISBN 0-8204-1139-6. ^ a b Lupton, Mary Jane (1998). Maya Angelou: A Critical Companion. Westport, Connecticut: Greenwood Press. p. 1. ISBN 0-313-30325-8. ^ Als, Hilton (5 August 2002). "Songbird: Maya Angelou takes another look at herself". The New Yorker. Retrieved 1 January 2012. ^ Italie, Hillel (6 May 2011). "Robert Loomis, editor of Styron, Angelou, retires". The Washington Times. Associated Press. Retrieved 1 January 2012. ^ Tate, Claudia (1999). "Maya Angelou: An Interview". In Joanne M. Braxton (ed.). Maya Angelou's I Know Why the Caged Bird Sings: A Casebook. New York: Oxford Press. p. 155. ISBN 0-19-511606-2. ^ Moore, Lucinda (1 April 2003). "A Conversation with Maya Angelou at 75". Smithsonian. Retrieved 2 October 2007. ^ a b Manegold, Catherine S. (20 January 1993). "An Afternoon with Maya Angelou; A Wordsmith at Her Inaugural Anvil". The New York Times. Retrieved 2 October 2007. ^ a b Brown, Avonie (4 January 1997). "Maya Angelou: The Phenomenal Woman Rises Again". New York Amsterdam News. 88 (1). p. 2. ^ "Maya Angelou: A Brief Biography". African Overseas Union. Retrieved 7 October 2007. ^ Younge, Gary (25 May 2002). "No surrender". The Guardian. Guardian Media Group. Retrieved 1 January 2012. ^ Maya Angelou (2010). I Know Why the Caged Bird Sings. Random House Publishing Group. ISBN 030747772X. Retrieved 17 May 2014. ^ Maya Angelou (2012). The Collected Autobiographies of Maya Angelou (illustrated ed.). Random House Publishing Group. p. 175. ISBN 030743205X. Retrieved 17 May 2014. ^ Moyer, Homer E. (2003). The R.A.T. Real-World Aptitude Test: Preparing Yourself for Leaving Home. Sterling, Virginia: Capital Books. p. 297. ISBN 1-931868-42-5. ^ A poem from this collection, "My Life Has Turned to Blue", was made into the title track of Nancy Wilson's album, Turned to Blue, in 2006. ^ a b Waldron, Clarence (25 December 2006). "Maya Angelou: On Christmas, Dave Chappelle and What Inspires Her". Jet (110). p. 29. Retrieved 4 October 2011. ^ Angelou, Maya. "On the Pulse of Morning". Electronic Text Center, University of Virginia Library. Archived from the original on 11 February 2011. Retrieved 28 May 2007. ^ Long, Richard (November 2005). "Maya Angelou". Smithsonian. 36 (8). p. 84. ^ Vena, Jocelyn (7 July 2009). "Maya Angelou's Poem about Michael Jackson: 'We Had Him'". MTV.com. Retrieved 11 July 2009. ^ Eby, Margaret (12 December 2013). "Maya Angelou pens poem for Nelson Mandela: 'His Day is Done'". New York Daily News. Retrieved February 16, 2014. ^ Wolf, Matt (12 March 2014). "The National Theatre's Global Flair". The New York Times. Retrieved 2 September 2014. ^ a b c Letkemann, Jessica (28 May 2014). "Maya Angelou's Life in Music: Ashford & Simpson Collab, Calypso Album & More". Billboard Magazine. Retrieved 16 November 2014. ^ a b Maughan, Shannon (3 March 2003). "Grammy Gold". Publishers Weekly. 250 (9). p. 38. ^ Waggoner, Martha (13 September 2006). "Maya Angelou to Host Show on XM Radio". Fox News. Retrieved 28 September 2007.